Once Venice boasted 103 bell-towers. Sadly, today only fifty remain. Some were demolished in the early nineteenth century when Napoleon closed down their churches. Without maintenance, others crumbled away. They were frequently struck by lightning, or collapsed because of unsteady foundations in the mud. When the campanile of Santa Maria della Carità collapsed in 1744, it threw some gondolas right across the Grand Canal into the square of San Vidal, an event transposed to San Barnaba for Talina in the Tower (chapter 13). Some Venetian towers, like that of Santo Stefano, have survived but with a dangerous lean like the tower of Pisa. The tower of San Pietro in Castello (also destroyed in this book), remains safely standing today. It was last restored in 2000. Uberto Flangini's twittering tower is invented - there was never a tower on that site. I imagined it in Quintavalle on the remote edge of Venice, looking over the lagoon, where the vaporetto stop of San Pietro is now situated. In Venice, it was quite normal for bell-towers to stand apart from their churches: given the fragile structure of the city, it was considered safer that way, as the towers were the first things to fall down in fires or earthquakes. Here is an extract from the book, describing the tower where Talina is sent to live after her parents mysteriously disappear. 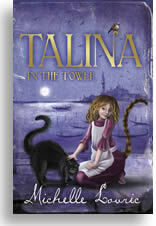 Every child in Venice knew the fairytale tower where Talina now lived. Yet no one knew exactly when it was built, though it must have been at least a thousand years before. And no one had ever taken care of it since. It was made of brick and pierced with arched windows on each floor until the belfry, which was topped by a pinecone spire. There was a risky-looking lean to the east, which partly accounted for the disappearance of the old bell - swept through the arches and down into the lagoon in a storm many centuries past. Missing bricks had made a honeycomb of its outer walls, in which thousands of sparrows built their nests, so the tower twittered quietly to itself from dawn to dusk. The tower perched uneasily in the lagoon on the north-eastern edge of the city. It was planted in the water, its base furrily mossed between the low- and high-tide marks. A cast-iron bridge, narrow and rickety, connected it to the land and its former church, the Madonna of the Sparrows, now ivy-clad and derelict. Just above the bridge's rusted guard-rail was a loose brick, where the key to the tower was hidden. From a distance, the tower looked cold and achingly lonely: inside it was colder and lonelier still. After three months' residence, Talina felt a sharp pang every time she saw other girls holding their mothers' hands. She hated to see fathers rowing their daughters to school. Even though the Guardian was famously rich, there was no jolly housekeeper, no maid, no valet, no butler and no cook. Instead, the three savage dogs, beaten into cravenness, fetched and carried. Drusilla catnapped in the kitchen at her peril.